The Labor Department says initial claims for unemployment benefits have risen to 626,000, a 26-year high. Wall Street is getting a little daring once again. Investors shook off weak economic readings Thursday and placed bets on retail and technology stocks after several companies posted better-than-expected sales and profit reports. The major indexes gained more than 1 percent, including the Dow Jones industrial average, which rose 106 points. According to preliminary calculations, the Dow industrials rose 1.34 percent to 8,063.07. The Dow fell as much as 111 points early in the session. Broader stock indicators also rose. The Standard & Poor's 500 index rose 13.62, or 1.64 percent, to 845.85, and the Nasdaq composite index rose 31.19, or 2.06 percent, to 1,546.24. Retailers including Wal-Mart Stores Inc. and Macy's Inc. turned in better-than-expected reports. Wal-Mart's January sales beat Wall Street's forecasts after the chain drew shoppers focused on necessities like groceries. Macy's, which this week said it would slash 7,000 jobs, on Thursday raised its fourth-quarter and full-year forecasts after reporting its sales. Overall sales numbers were still weak as consumers again curtailed their spending, but not as bad as investors feared when they beat retail stocks down in recent months. "We're being overly pessimistic on things like retailers," said Chris Cordaro, chief investment officer at RegentAtlantic Capital LLC in Morristown, N.J. "People realize you're going to have shop somewhere." The technology-laden Nasdaq composite index led the major market indicators after Akamai Technologies Inc. said its fourth-quarter earnings rose a better-than-expected 13 percent as more customers signed up for its Internet traffic-management services. "The economy at some point will recover and when it does, tech is a pretty interesting play," said Subodh Kumar, global investment strategist at Subodh Kumar & Associates in Toronto. "It will likely be one of the first movers." 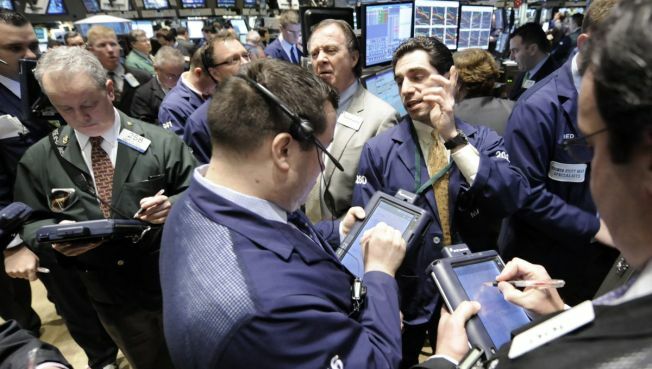 The reports helped the market overcome a flurry of bad economic news. Unemployment benefits claims rose last week to a 26-year high, and factory orders fell for the fifth straight month in December. However productivity rose by 3.2 percent in the fourth quarter, more than twice what analysts expected. Investors are bracing for Friday's January employment report from the Labor Department. The monthly reading is one of the most important economic indicators because rising unemployment cuts into how much consumers spend. Consumer spending accounts for more than two-thirds of U.S. economic activity. A poor reading could deliver a big blow to the market, though expectations are low. Economists predict the unemployment rate rose to 7.5 percent in January from 7.2 percent in December. That would be the highest rate in 17 years. The Russell 2000 index of smaller companies rose 6.60, or 1.47 percent, to 455.08. Advancing issues outnumbered decliners by about 2 to 1 on the New York Stock Exchange, where volume came to 1.63 billion shares.